I know Heidi Kingstone, writes Pat Lancaster. I wouldn’t say we were exactly friends but we bump into each other at certain events and I have always enjoyed chatting to her. One such event was a New Year’s Day party held at the home of our mutual friend, the journalist Adel Darwish. I can remember being surprised and impressed when Heidi said she would shortly be leaving London to work in Afghanistan. I didn’t bump into Heidi again for a very long time. In her brilliant new book which fills in the fascinating detail of those missing years, Heidi comments: “There are rare moments in life when the planets align. For me, this was my time in Afghanistan. 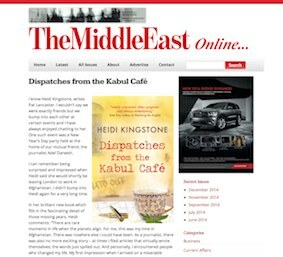 Dispatches makes The Lady’s Summer Read List Thrilled to see Dispatches from the Kabul Cafe in The Lady's summer reading list!